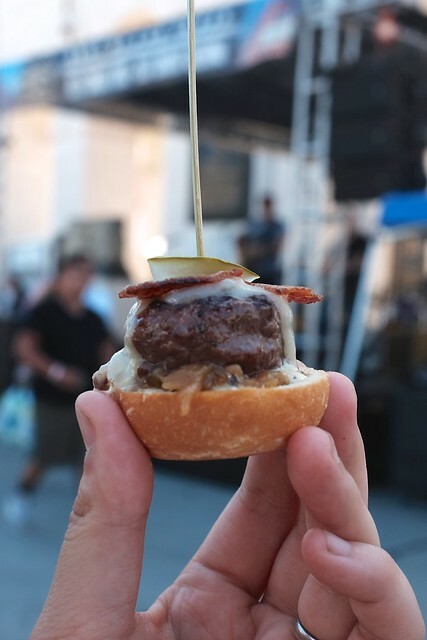 This past Saturday was the LA Weekly Burgers & Beer festival. In addition to being a weekly alternative paper, the LA Weekly is also a food festival churning machine. The weather was great, the crowds were manageable, I received free tickets from the Weekly, and I somehow snagged free parking. What more could I ask for? One of the better burgers was Barrel & Ashes’ burger bite. With so many stands offering burgers and so little stomach space, I appreciated that they did away with the top bun to focus on the main ingredient: a great patty. Unlike most of the vendors here, Badmaash didn’t play it safe. 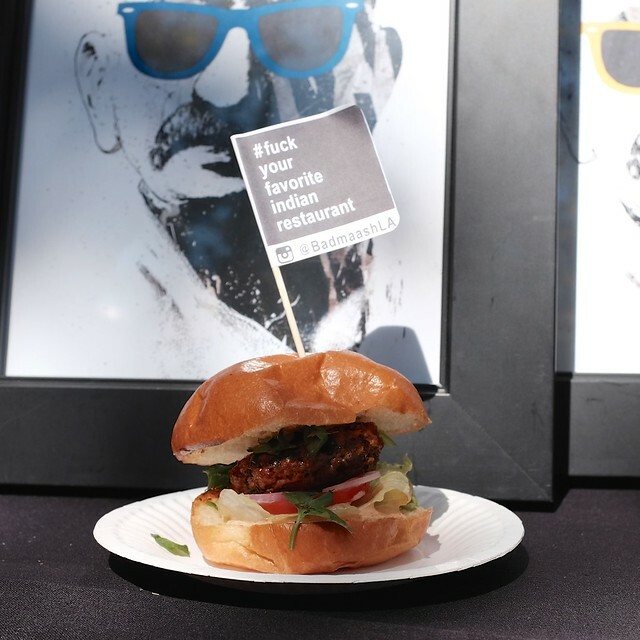 Instead, they went with a full-flavored, aggressively spiced lamb patty burger. Their strategy paid off because it was one of the burgers that stood out. 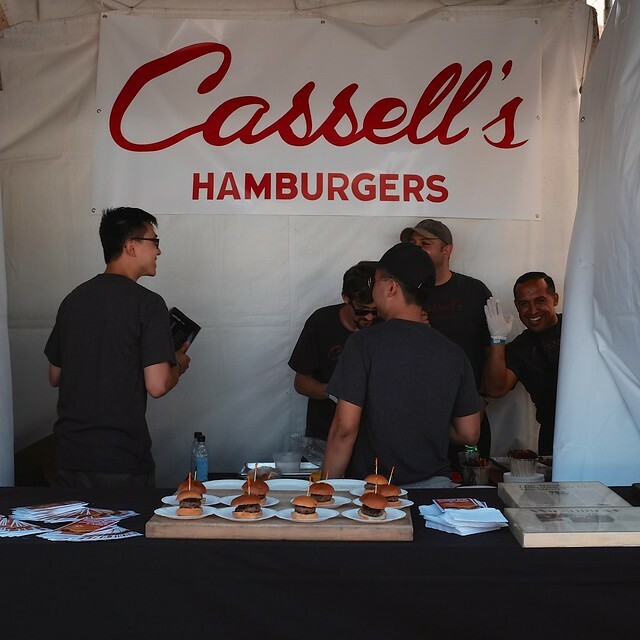 Word on the street is that Cassell’s has a really good, no frills burger. Their rendition of it at the festival may have looked plain compared to that of Animal’s or Pink’s, but they stuck with the basics and excelled. 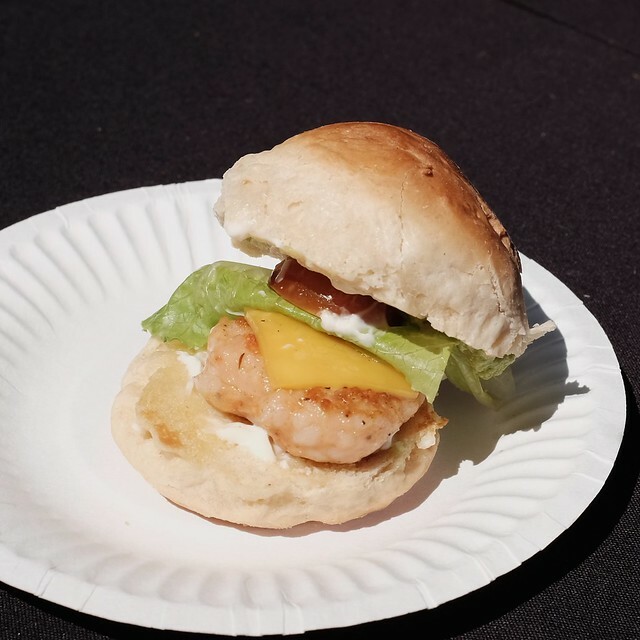 Another bite of something different was El Cristalazo’s shrimp slider. The perfectly cooked shrimp went surprisingly well with the usual burger accouterment. Overall, the festival was a success. 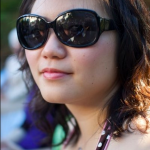 The venue was perfect, with enough room and shade to be comfortable. Most of the lines were manageable. The beer selection had a little something for everyone, instead of being super heavy on IPA’s. My two favorite beer vendors there were McLeod’s and Phantom Carriage. Will would have preferred at least one stand doing a veggie burger, but I can see how that would be a risky gamble for a vendor. I thought that an afternoon full of eating burgers would put me off them for a while, but going through the pictures today, I wouldn’t have a repeat of a few of the bites I had yesterday. The LA Weekly comped my 2 tickets in hopes that I would write about it. Which I am doing right now. 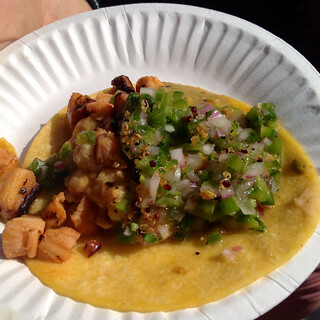 One of the first tacos I had this Saturday was the bacalao/octopus/seafood salad taco from La Guerrerense of Ensanada. It was so good that I went back to get a second helping. It was so good that both times, I devoured it before taking a picture it. The only bad thing is that I’d have to go to Mexico or wait till next year to try their taco again. 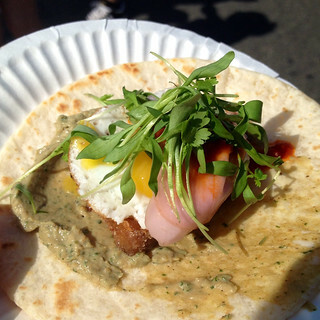 Eggslut’s pork and quail egg taco was perfect: Crispy, flavorful pork underneath a perfectly fried quail egg and a pile of thin-sliced pickles and herbs. I don’t know what that puree under the pork was, but it was tasty. Like their GCM location, the Eggslut tent also had a long, winding line in front of it. I hope this taco makes an appearance on the GCM menu soon. The surprise of the day was that there was a vegetarian taco stand that was super nice about leaving off the dairy to make a vegan taco. The second surprise was that their taco was really good. Taco Maria’s mushroom chorizo taco with house-made chips on top were so good I almost thought Will got a meat taco by mistake. The best part was that because their taco was vegetarian, there wasn’t that much of a line for it, so it was easy to get seconds. People who avoided that tent because it was vegetarian missed out, but more tacos for us! 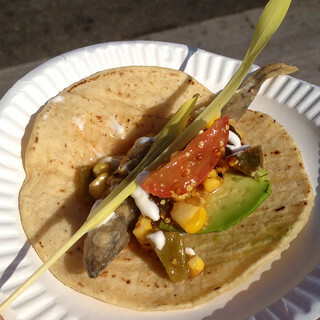 Thanks to a tip from a friend, I got in line for a smelt taco from Corazón y Miel. It was artfully plated and tasted as good as it looked. The smelt was full of eggs that popped delightfully between my teeth. This was a different take on a fish taco that I enjoyed. I had another octopus taco which I believe was from Picca. It was good, but its flavors were nowhere near as good as the one from La Guerrerense. I thought the flavors of Picca’s was a bit muddied and not as bright as what I would expect from them. 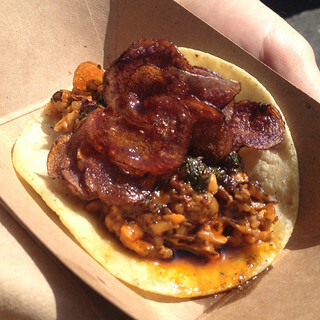 What a great problem to have: one tasty octopus taco was not as delicious as another one. I really wanted to like the fish taco at Pez Cantina. They had an impressive array of house-made condiments for the fish taco. But no amount of condiment could disguise an over-cooked piece of fish. The batter was nice and crispy, but the fish itself was dry, hard, and tasteless. 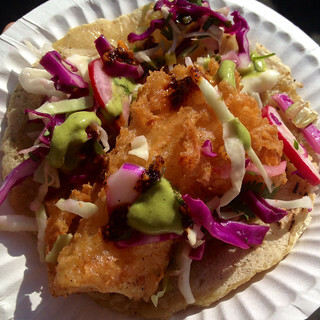 Maybe I’ve just been spoiled by fish tacos from Taco Baja Ensenada, but this one was just not worth the line. The line to get into the event was pretty slow. Considering most people had printed tickets or tickets on their phone, I would expect the line to get processed pretty quickly, but that wasn’t the case. But that line was nowhere near as bad as the line for drinks. Whoever decided that alcohol and bottles of water would be bought at the same measly handful of locations needs to re-think that plan. Those lines snaked through several food lines, adding to a lot of confusion. If I were one of the people who bought drink tickets with their ticket and I had to stand in a 30-minute line for a $5 crappy beer or sticky sour mix cocktail, I’d be pretty angry. I didn’t have drink tickets and I’m still angry about that. From what I hear about the tequila garden, it was similarly disappointing. I get that the Weekly has to make money off of an event like this, but having big soulless tequila vendors and Spearmint Rhino stands in the festival clashed with the better curated food vendors.